BETHLEHEM — The Bethlehem Democratic Committee has overwhelmingly chosen to support two candidates who will not be appearing on their party line in the November election. 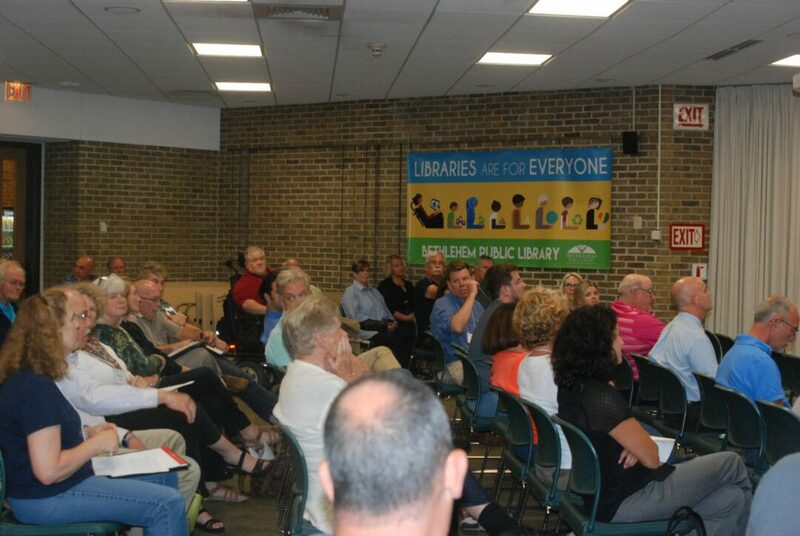 During a meeting at Bethlehem Public Library on Thursday, Sept. 14, committee members debated how to approach the coming election after two Democratic candidates filed a lawsuit that bounced their opponents, BDC’s chosen candidates, from the Democratic ballot. After Democratic Elections Commissioner (and former BDC Chair) Matt Clyne informed them of of an error in paperwork BDC filed with the Albany County Board of Elections, Town Board candidate George Harder and Highway Superintendent candidate Dan Morin filed a lawsuit that ultimately invalidated the candidacies of their respective opponents Dan Coffey and Giles Wagoner. Clyne, Morin and Harder have all criticized the process by which BDC leadership chose to endorse Coffey and Wagoner after Brent Meredith accepted a job at the University at Albany and declined to run for reelection late in the process, after petitions had already been gathered. The timing of events, said current BDC Chair Jeff Kuhn, necessitated the hastened process. The state appellate court decided in late August that the certificates filed by BDC had been properly invalidated, ejecting Coffey and Wagoner from the Democratic ballot line and denying them a primary contest against Harder and Morin. As the Working Families Party, which filed the substitution paperwork correctly, also endorsed Coffey and Wagoner, they will still be appearing on the November ballot — but only on the WFP line. On Sept. 14, the full Democratic committee gathered to decide whether they would support the candidates appearing on the Democratic ticket or the candidates appearing on the Working Families ticket. A decision to support the candidates appearing on the WFP ticket means risking a split vote, as some Democrats are likely to simply vote their party line while others will vote with the committee to support their party’s chosen candidates. In an election season with tough GOP competition for those seats, the decision was not one to be taken lightly. Committee members, who clearly felt their ballot line had been hijacked, however, were unwilling to be held hostage by candidates they repeatedly characterized as under qualified, if not downright dishonest. After Morin released video of an August BDC meeting to former Bethlehem Republican Committee Chair Keith Wiggand, in which both men misconstrued something Kuhn said to mean Democrats had knowingly filled out the substitution certificates illegally (rather than merely erroneously), committee members have questioned his loyalty to the party. Wiggand posted the video to his Facebook page and indicated that he would be attempting to get BDC leadership arrested and disbarred. At the outset of the Sept. 14 meeting, committee member Emily Saunders introduced a motion to request Morin not share video coverage of the meeting with Wiggand. The motion passed. Morin told Spotlight News he had no intention of showing the video to Wiggand, who he has described as a lifelong friend, and said that he was merely making the recording to review the committee’s statements for any inconsistencies. Incidentally, both Harder and Morin came to the Sept. 14 meeting directly from a fundraiser for Gary Fish, the Republican candidate for Town Supervisor. Morin later told Spotlight that he was unaware that event at Swifty’s Pub would be taking place and he had only been eating dinner there with his kids, but he and Harder were seen seated at a table with Fish and his supporters. Morin later explained he has friends on both sides of the political aisle, having lived in Bethlehem for almost 50 years. “I grew up with a lot of people and just because they might be on another party doesn’t mean I’m not friends with them,” he said. Having ejected Coffey and Wagoner from the Democratic ticket, Harder and Morin requested that BDC formally endorse their candidacies, including financial support for campaign materials. Harder referenced BDC by-laws, which he said require the committee to support him and Morin as the Democratic candidates. During the Sept. 14 meeting, Kuhn responded by addressing Harder’s claims, going through the by-laws and concluding that the committee has a responsibility to support the most qualified Democratic candidate, regardless of which line they are running on. He noted committee members have repeatedly indicated overwhelming support for Coffey and Wagoner and went on to question Harder’s campaign tactics, which he claimed ran afoul of the very BDC by-laws invoked by Harder to impel BDC endorsement. Several members voiced their agreement. Ultimately, the committee — again — unequivocally decided to support the candidacies of Coffey and Wagoner. “I am so honored and humbled to have the endorsement of the Bethlehem Democratic Committee,” said Coffey. “I will continue to campaign door-to-door meeting one voter at a time and keep my campaign focused on issues and how best to move our Town forward. I also have the endorsement of Bethlehem Indivisible and the Working Families Party. I am confident the well-informed voters of our Town will vote for me on Row “E” come November. Coffey said he’s ordering bumper stickers saying “Endorsed Democrat on Row E” and will be placing them on all his lawn signs. Morin declined to comment on the events of the evening.